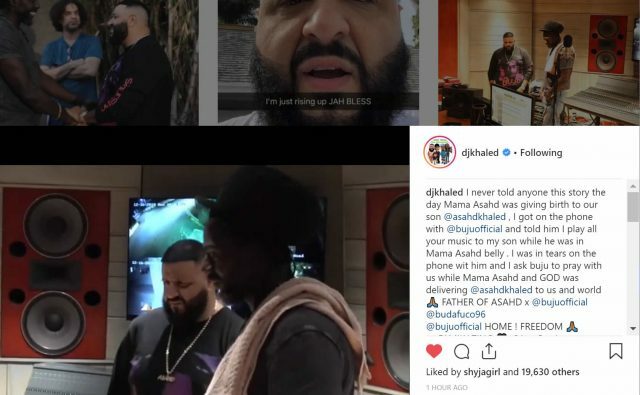 DJ Khaled has shared a video revealing the moment he and his family met Buju Banton on Sunday hours after he touched down in Kingston, Jamaica to visit the Reggae Star. The American DJ, record producer arrived on the island by private jet shortly after 4:00 pm for ‘top secret’ trip, however, his Buju Banton sweater revealed his intentions. “The day Mama Asahd was giving birth to our son Asahd Khaled, I got on the phone with Buju Banton, and told him ‘I play all your music to my son while he was in Mama Asahd belly,'” the president of the record label Def Jam South, and CEO and founder of We the Best Music Group writes in the caption shared with the video. Khaled and Banton’s friendship dates back to the early ’90s when he launched his disc jockey career DJing in reggae soundclashes, mixing dancehall and hip-hop before hosting a weeknight radio show on Miami’s 99 Jamz and appearing in popular Jamaican film Top Shottas.